200 Business Cards; 2 large Address laminates; 4 laminates giving full details for each of the products; 2 price lists, as cards on stands; 2 pages of small stickers with my logo, to use to seal up the paper I was using to wrap the breads at point of sale. 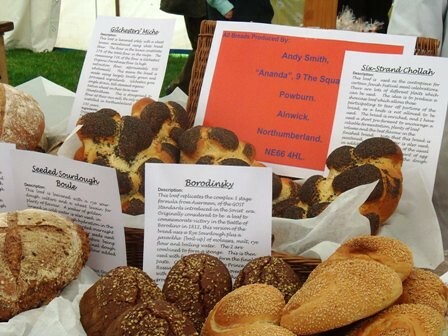 A wonderful array of breads and wonderful write-up, Andy! Thank you for sharing. It was quite moving to read your expressing your gratitude and love to your friends and family, especially to Alison. I wish you and Alison an even brighter and happier future than you've had already. Good luck!....and big cheers for the brightening future for the British foodies! I firmly believe that the time for the re-birth of good bread here in the UK is right now. It is happening all around us and we [you and I and other UK people at TFL] will all play an important part in its future progress. If I remember from your posts, you were on the production side before teaching at the college. Was there an element of "the good old days" present as you prepared for the sale? Although not explicitly stated, it sounds as though a new bakery is in development. If that is your intent, then I wish you well with your new endeavor. And I would be somewhat envious of your customers, except that having been bitten by the bread baking bug means that I scarcely ever buy bread anymore. Of your lovely assistants, which one is wearing the hat--Alison or Anna? Yes I worked in bakery production in some shape or form from 1987 right through to the end of 2005. My time was filled with challenge, enjoyment and learning. And I would happily spend more time in the future baking in commercial quantities. I don't look back, however...just forward for new times, more exciting and rewarding still. New bakery business of some kind is certainly one of the options I'm exploring just now, amongst a number of different possibilities. Very impressive show of effort my friend. While there was never any doubt about your ability to produce the bread products, you made an impressive display that looked professionally artisan. 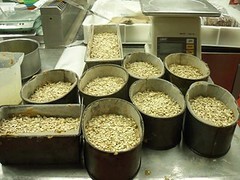 Keying on the locally milled grains was I'm sure, appreciated by your customers. If you were looking for validation of a concept prior to taking the next step, I suspect you have found your course. Good luck to both of you. Yes, that's so true, Eric. All was very nicely written and wonderful photos of your work. The Silician Scrolls really caught my eye..also the other breads are outstanding! They sound and look exceptionally delicious. I'm baking just a couple of Sicilian loaves today...sometimes I shape in scroll and sometimes in a batard..the batard works a little better for us slicing for 'sandwiches and toast', I guess because it's has a little more volume...which is what I liked about your scrolls, they look so very large and full...great for slicing for everyday. I like large loaves and I should try my scrolls larger. Next go I'll make a larger batch. I usually get 2 scrolls. I've read that you need to let the dough rest a little longer if using the semolina grind, rather than the durum flour, in the formula I have, so it can have time to soften the grain. I have a new supply of duram flour and though I have baked theses before, I would still like to try them with a semolina grind. For now I have all this fresh durum. Wonderul formula, Andy. 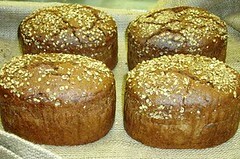 Sicilian bread is a favorite of mine. Your Scrolls had to be a real eye catcher at the market...not to mention all the other beauties you baked. Thank you for sharing and the very best always to you and yours! Andy, Wonderful bakers Fedora's. They are all the rage over here now. 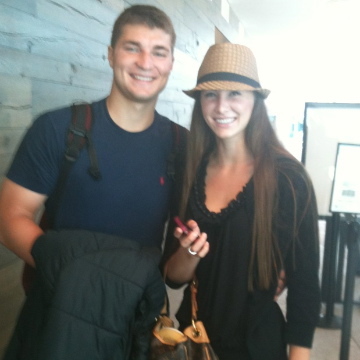 My darling sweet grandaughter and her just as sweetest boyfriend! We call this type of hat a "Trilby". 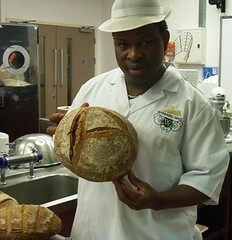 It's the only type of hat I feel comfortable in as part of a baker's uniform! I usually wear a hairnet underneath, but forgot to bring them out to the show that day...there's a confession! For the coarser semolina, I would recommend soaking it in all the final dough water for 30 minutes to an hour first, before going on to make the final dough. It's a good tip! A couple of decades ago there was a book in the USA self-help market titled (as my memory serves) "Do What You Love, the Money Will Follow". I never bought it, I thought the title said it all. Looks like your living it! Best of all on your new ventures and adventures. I hope you won't be too busy to contribute your much read and welcomed postings on TFL. I cannot imagine making a living doing something which I didn't enjoy or have great interest in. I watched my Dad being miserable, hating his job as a schoolteacher for years and years. I just couldn't do that. What a wonderful collection of breads. Thanks for taking the time for all of your informative posts. Your teaching career lives on, it just moved over to TFL! Actually, my contribution to TFL teaching resources is very small. 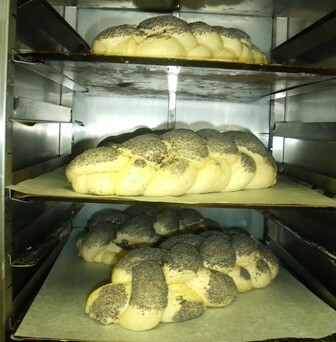 I am always keen to stress to baking students that the wealth of information on this site is just about as good as it can possibly get for a dedicated student wanting to know all the ins and outs of high quality breadmaking. I am very happy to be a small contributor to that. Seriously though, what you've done with this... I can't quite figure how to put it other than to say: I want that here. Wonderful. Can you not find this sort of bread at specialist places in California? One of the few shortcomings of this side of the state, not much in the way of exciting bread. A small price to pay. Pulling a good loaf out of the oven (when luck is on my side) pretty much makes up for it. all so expertly made, with much care taken with the making and display. 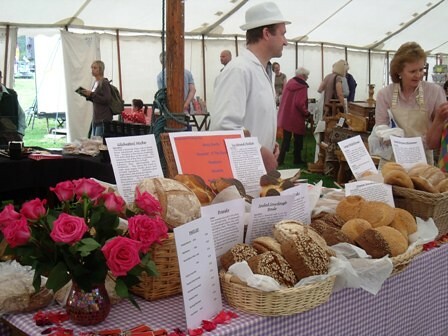 Your villagers and fellow vendors must have really appreciated your hard work, the write-ups about all of the breads, and hearing about locally-grown and milled wheat. 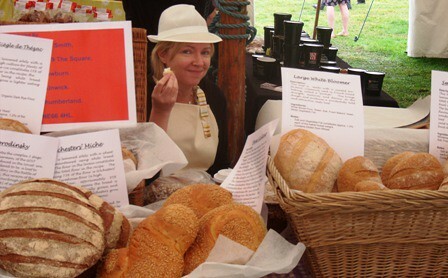 Fortunate villagers indeed – to enjoy the integrity and authenticity of your breads – truly special! The loaves are all beautiful, each and every one. 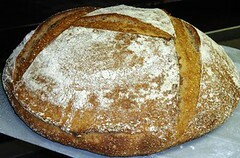 I really liked the “A”-scored loaves, and those oval Rossisky loaves (such a nice shape for a bread pan). “Bread and Roses” is the theme I’m using. So very happy to see your success at the show, and that you have the support of your nearest and dearest. I think that authenticity and integrity was clearly exactly what those at the Show really spotted and saw as all-important. And it's a key part of the "Bread and Roses" theme isn't it? "This is something really just that bit special"
Love the oval tins; I'll miss those. I think I may have a dart on Ebay see if I can find something similar! 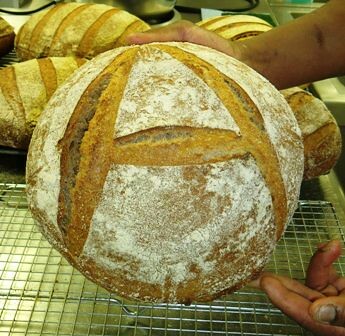 There was only one Gilchesters Loaf scored with an "A". But I may adopt it for all of them in the future. It made a lovely little logo, for sure! What a Spread of Bread! Wow!! I would be thrilled to find such a beautiful and varied array of breads at the best artisan street markets in food-crazy San Francisco. Nice job by the whole team on the production and presentation. And you offer free bread-ucation, too! Glenn you have all the captions! 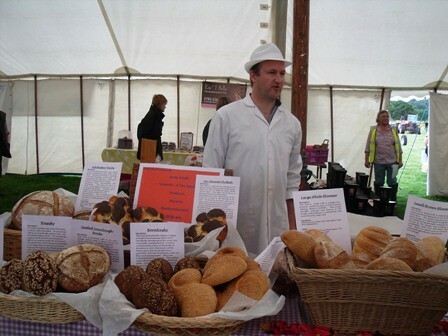 Brilliant array of breads here Andy, just stunning! You've accomplished a number of things here, not the least of which is establishing that there is a desire locally for hand made craft bread. I'm interpreting this in part as being the preliminary market research of a future retail baking business in the plan you refer to. 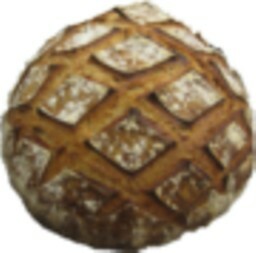 Judging by your sales it looks like your community is in solid support of being able to purchase real bread made from quality ingredients. That has to be very encouraging to know as you move forward with your plan, that and the fact your family and friends are with you all the way in this is vitally important. Whatever your ultimate business goal is Andy, I've no doubt that you'll achieve it and hope that any obstacles encountered along the way are minor and temporary. Here's to your future success my friend, and all the very best towards achieving it. Man with a lot of plans! Thank you for your support and insight, as always. It is especially valued from a fellow craft baker. You are so right about the key factors I gained from this experience; and I am so glad, as this was my insight as to what people would really want. Please tell me I am correct here: no large operator would want to get into this market on any sort of honest basis? I'm only interested in honesty; the public will always see through the phoney...in the end! If you're talking about even a medium size bread 'factory' I'm reasonably sure you're safe from them competing with you from a position of honest craft. They'd need to find a group of skilled craftsmen willing to work for minimum wage to make it worth their while. On the other hand if your sales are threatening what they consider their share of the market, they'll work hard to prevent that from happening by offering product that's close enough to your own (for some people) and priced lower, that it may draw some consumers away from your door. I've no idea what sort of players are in your local area or what volume of production you're contemplating, so this may never be an issue for you. 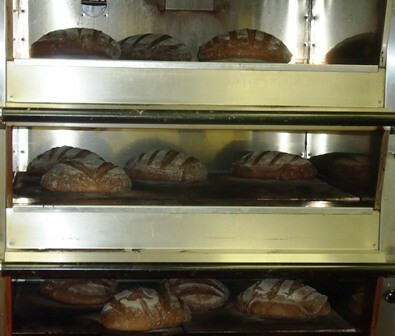 I think if there are enough people in your area that are committed to supporting the local farms, mills, and craftsmen like yourself that know how to get the best from what the farmers and millers produce it shouldn't be a problem to create a following for your distinctive breads in short order. I know you have lots of help to draw from on the home front and plenty of support here on the site, but what I wouldn't give to be able to hop over and lend a hand where I could to help get things rolling. For now I'll have to be content with just being able to offer moral support... but that could change in the months ahead. It's rather wet in this part of the world, but, otherwise extremely lovely. You are welcome guests anytime, you know that. Fabulous start for the next phase! 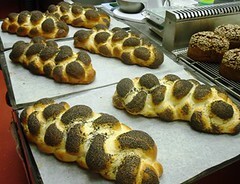 The breads are gorgeous, of course, and the write-up is wonderful. It shows your enthusiasm for baking and having others enjoy your production. I'm looking forward to each new chapter in the story of your successes to come. There could be many chapters to come, of course! I'am glad you've found yourself a new yet exciting career, Andy! Thank you for taking the time to post all this, we at TFL are delighted that you're sparing the time and effort to share such a nice aspect of your life. I wish you all the best with your future endeavors. And your breads shown, as usual, are truely lovely and well crafted. It's not "found" yet, but I am enjoying having a very good look round, for sure. It's a pleasure to share the journey. to touch, smell and taste all these great breads! With such skill, as well as attention to business details, I have no doubt you will be successful in the next stage of your career! the detail needed will evolve, for sure. Lots of fun and hard work along the way. It's so good to have compliments about fine detail from you; I am all too aware of the detail going into your baking and the high quality end products you come up with. Way to go, Andy. Those are beautiful breads. I wish you all the best in your new endeavours. After learning from you on our TFL course I was expecting some decent loaves but really - that display is amazing! 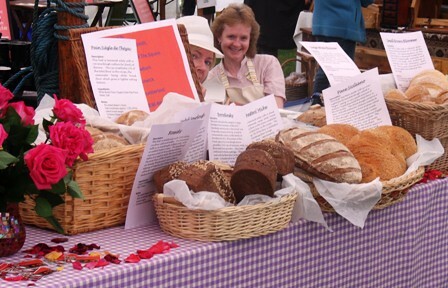 An incredible variety of bread from just one person (with a bit of help) I wish I'd been there to see them in person! Perhaps you could move over to Vancouver Island and work with Franco to build a large artisan bread business (and find a vacancy for an accountant/baker :) ). Whilst I agree with you that the north east of England is a lovely area I would choose Vancouver Island every time (and I've visited both)!! Your display above clearly shows why we learned so much on the TFL course, you really deserve the title of "Master Baker". My bread has noticeably improved since the course (in my opinion and according to my wife) and the flour from Little Salkeld water mill that I bought from you is our "new best friend", almost the whole 900g loaf has disappeared in less than a day! But more of that in my own post. I'm off out to Chester to buy some flour from Walk Mill so I will let you know what it is like. You are definitely a star. Thank you for your very kind words, and it is lovely to hear from you. I am so glad you have found a way to appreciate the joys of the Watermill flour. When I first started baking professionally in 1987, we used exclusively Little Salkeld Watermill 100% and 85% wholewheat flours. A couple of years later and they introduced an Unbleached White. We also took their rye flour. 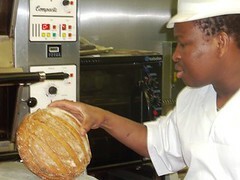 The only exception in the early years was the malted flour which we sourced from Doves Farm. It's unique and the owners of the mill are great people too. Vancouver Island with Franko? I'd probably move tomorrow, although I suspect Alison would take a good bit more persuading!? Just adding my tuppence-worth of best wishes for the future...again! I just wonder how long it will take the College to realize they should've offered you a 30% higher salary for all of your hard work and just to keep you 'on-board'...Oh, well! It's their loss and the rest of the world's gain! Be well and stay 'outstanding' in your craft, sir! I was offered a 10% pay cut, an increase of 140 hours contact time and removal of teacher's pay and conditions. Your proposal of a 30% rise is somewhat more attractive. Alas the current climate in UK education, especially at FE and HE levels under our extremely unenlightened "Government" offers a very poor outlook indeed. Remaining outstanding in my craft will be utterly essential, believe me! I'd already done spreadsheets, working out my budget to repay the government's 'stuff-up', to get my car functional and find a new place to live. All that was needed was my present hours and salary and a little spending restraint on my part. I couldn't sign the ludicrous contract, of course! A friend had some property in a rain-forest area, up north, where I languished for about 10 months in an old caravan, which I restored while living in it and looking for work. That was really good fun! You've got the knowledge and the talent to be back on your feet in no time at all, I know it! I hope it takes you less time than it took me to find that 'satisfaction'. What an epic bake and what a great write up and wow what a change, i have been reading a lot about the changes that are being forced through,in the UK but here it is in practice! I have no doubt that you will do well what ever you decide to do, and i join all the other TFL folk in wishing you well in your next endeavour. I my self was offered the chance to do the same job that i had been doing for 21 years with a pay cut when the West Australian Government privatised the workforce side of the public transport service here in Perth. I am proud that over 400 of my fellow workers were of the same view as me and sought redeployment or at least a decent redundancy. These fellow workers were mostly longserving experienced drivers like myself so when 400 drivers x 20 plus years experience goes out the door replaced by new no experience people then that is a huge loss. (still having troubles ) Some of us were fortunate to find work redeployed to other government jobs and the rest were eventually able to be paid a decent redundancy of 4 weeks for each year of service uncapped. it is said that you often have three careers in life, so i have had my professional career as a tradesman baker 10 years, 21 years as a bus driver and now approaching retirement 10 years as a supply officer. each time the changes were virtually forced, local bakery bought out by multi national and wanting staff to transfer to new super premises on the otherside of the metro area. privitisation of labour for still government owned buses. Currently in the supply/ procurement job where i get the chance to use some of my bread skills and hopefully a year or 2 more before an early retirement and best of all is only 10 minutes away, monday to friday no late nights or early starts and not going to be beaten up for the sake of a lousy fare. On a lighter note I am still looking forward to meeting you in person next year, or perhaps you may have more time to travel and we could see you here in Aus where you would be made most welcome! Back home in UK, a certain person's vision of "The Big Society" seems to be falling to pieces. No excuses for bad behaviour: absolutely not! But we all need to have access to both bread and roses. I don't think the Tories will ever really quite get this. Such a shame; a vision of local communities looking out for each other is great. But it won't happen unless there is investment. And all we are seeing right now is cuts. As ever: out of touch! I'll just get on and make good bread, and enjoy that. That's enough!